Some nights, you want to sit down and play a game that puts your brain to the test. You want to develop a strategy that has your opponents begging for mercy by the last round. You want to rack up points like you’re Wilt Chamberlain (for you nerds out there, that’s a famous basketball player). You want to make choices that will later have you pointing at your opponent and yelling “Ha!” when it all pays off. And then some nights, you feel like throwing farm animals. PtP:PPE (see? even the acronym is ridiculous) comes with a set of rules, but they make the game way more complicated than it needs to be. So I’m just going to tell you how we play. 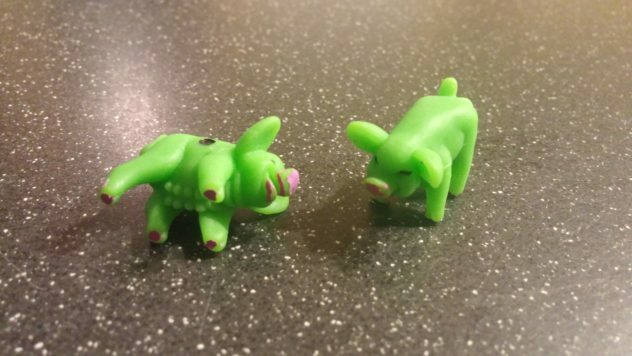 Each person is given a pair of pigs (you may share, if necessary). 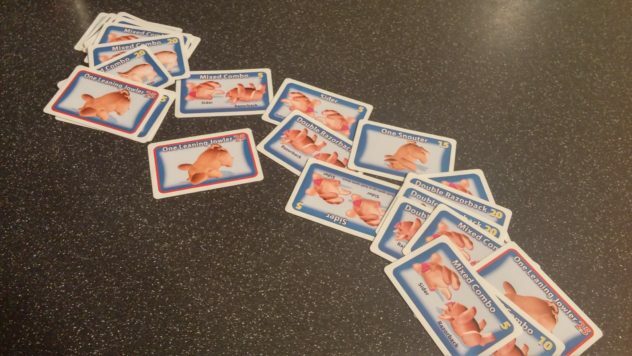 You shuffle a stack of cards that shows the various ways the pigs can land when rolled, then flip one card over to be active for that round. On your turn, you roll your pigs just like dice, attempting to get your little oinkers to match the positions pictured on the card. They might be laying on their side, standing on their feet, or tipped forward on their nose. Get a match before anyone else and you win the card and its points. Get a match on your very first toss and you get to roll for bonus points, which involves rolling all eight pigs in the game at one time. There are also 3 cards that we use as bonuses – the one-eared leaning jowler. The pigs almost never land in this position, so for our games, we set all three of these cards to the side. If during the course of the game you actually roll one of these, you can lay claim to one of the cards. At the end of the game, whoever has the most points wins! It’s all incredibly silly, and many might stick their nose up at it simply for that (though that might be appropriate, given the swine-based theme). However, we have had great success with this game at family reunions. Younger kids without much gaming experience quickly catch on, and the older generation finds it amusing enough to play a few rounds with them. It only takes about ten minutes, so people can quickly rotate in and out. There is absolutely no skill involved. I mean, unless you’re part of a family that tosses pigs around with regularity, I guess. But I dare you not to cheer or talk some smack when you get to take a bonus roll or get that bonus card. The game comes in a tiny little pouch with four pairs of crazy colored pigs and some cards. The whole thing is a little pricier than I would prefer, and I’ve only seen it sold online. There’s also a shortage of bonus point cards in our version, but that could be because of the way we play. However, these are just tiny issues for an overall good product. If you have a gaming session or event coming up with younger kids and/or their grandparents, there are not many games I would recommend more than Pass the Pigs.